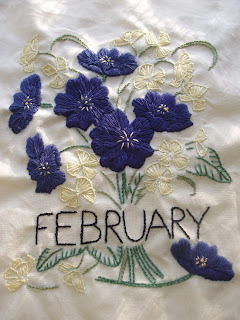 I did start doing the embroidery in February, but it did take a little longer to stitch than the other blocks. I again used DMC threads for the stiching. Stitches used-satin, long and short, stem, straight, french knots. I could have told you the colours, but I tidied up and put them away, lol. The light patches on the fabric is the early morning sun coming in through the morning. It has been lovely to get up and see blue sky and have the sun shining. It is even getting a little warmer in the sun too. Won't be long before we start seeing the primroses out for real. This looks really fantastic, you can be proud! That's a lovely piece. We've a had a rainy spell here, but spring is clearly on it's way! It's very pretty. I love the color combinations. Ooh, morning sun -- it's perfect on those colors, too! That is stunning! Your embroidery is beautiful. I'm glad you have seen the sun! It's still getting hot here....hopefully it will be cooler VERY soon!! !